Raid trigger during Blockers step? does the foundry street denizen trigger supply to other copies on the field? The 3 Gnarled Scarhide (they'd die) and a Butcher's Glee . If the deck was made more Heartless Summoning-focused I'd also cut the rest of the Butcher's Glee and 2 Titan's Strength (or any 3 other spells) to make room for the rest of the Kragma Warcaller s and Ragemonger s, since they're what let the deck go crazy with Summoning. It could also be worth experimenting with cutting 1 or 2 lands, Summoning + Ragemonger will give you discounts and 20 is enough to get you to 4 lands on curve around 60% of the time (probably the max amount of mana you'd need with Summoning). I have this kinda thing in RU, featuring Stormchaser Mage . Hi AvengerOfDorubah! I use this deck in competitive plays in a store in my country. It runs very well, and if I draw a good hand, in turn 3 or 4 my opponent is dead. 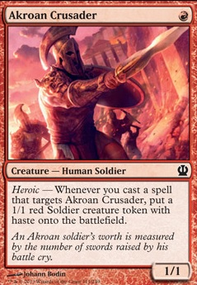 A good hand would be turn 1 Plains Favored Hoplite . Turn 2 Mountain, attack, Titan's Strength on Favored Hoplite and you are running for 5 of damage. If you opponent want to destroy your creature, you have a Plains for Gods Willing . Its a very violent deck and I like to play it. Spells blue of Theros block are interestings, you can draw cards, but I think that those spells are best for midrange decks, or control decks. I'm now building an ideas of a G/B deck of Theros whith Prophet of Kruphix , and other U/B cruel control, so if you had suggestions they are very welcome! I've gone back and forth between Brute Force and Titan's Strength in that spot Salty_Englishmen. Titan's Strength is just a bit cheaper on TCGplayer, which allowed me get below my $5 budget. 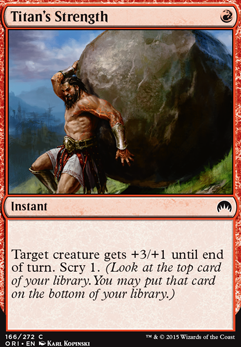 Also, the scry can be surprisingly helpful - if you start off with that on turn 3 and play a Crash Through , you can sometimes pick up the Assault Strobe or Apostle's Blessing you need to win the game right then. Since you were looking for more combat oriented stuff maybe consider cards like Feat of Resistance , Blustersquall , Titan's Strength . Also extra combat phase stuff would be good like Seize the Day and Combat Celebrant . Dracoson on Izzet tuned enough? Let me preface this by saying I've been playing Blitz for the last few years, and I love playing it. Having said that, I have several notes on this, so bear with me. First things first, where's the combo? Temur Battle Rage is the soul of this deck, and it isn't present at all. That's where the deck gets its ability to finish out of nowhere. Pair it with either Mutagenic Growth or even Titan's Strength and boom. Growth tends to be preferred because you can cast it with no mana open, but either is acceptable. Needs more creatures. 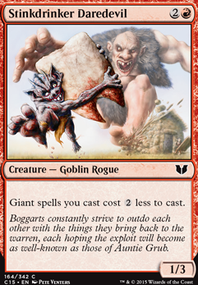 I'm not talking a lot more, because you still want a certain spell density, but generally speaking, some combination of Delver of Secrets Flip and/or Elusive Spellfist s are in the list, otherwise you just fold to incidental removal. I like 4x Delver, 4x Fiend, 4x Cypclops, but you should definitely have 3-5 more creatures. Card selection. 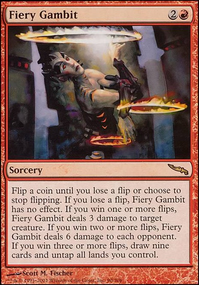 I understand shying away from Preordain if you're trying to keep to a budget, but Ponder and at least one other card selection spell is a must. I don't care for Brainstorm but anyway you slice it, you want several of these type of spells. Typically it's 8-12 with Gush on top, but this deck NEEDS to look at a lot of cards to get to the ones it needs for the situation, and targeted cantrips just don't cut it. Mana base. I see two problems here. First is straight up number. You're running 16, when 18 is a more realistic number. Those first two-three land drops are essential. The secend issue is the number that come in tapped. There is a certain value in playing cards like Evolving Wilds , Terramorphic Expanse , and/or Ash Barrens when you are playing Brainstorm , but you don't need to pack duals on top of it. I wouldn't play more than 6, and then I would want 2-3 of those to be Ash Barrens . 4 is probably a better number. Use the duals if you move away from Brainstorm, and the "fetches' if you don't. Don't forget protection. 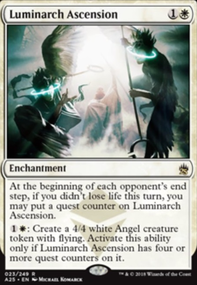 Apostle's Blessing is the go to, but you need some way of keeping your creature alive on your big turn. Dispel can also do that. Gitaxian Probe is also helpful to make sure the coast is clear before you commit. Now, as for Fire / Ice , the card is fine, and there are a few flex spots to include it as a 1-3 of. When I tested it, it seemed underwhelming. It's a utility tempo card, and this deck plays more of a combo deck with a tempo back up plan. Hi again Sagarys. After playing this deck in the current Modern format here is what I found out. First off it's explosive and definitely still lives up to it's name. Swiftblade Vindicator is a perfect upgrade for Boros Swiftblade. She's seriously an all-star in this deck, and her only drawback is she gets countered by Goblin Chainwhirler. Other than that, no changes to the deck. Tajic, Legion's Edge is not better than Anax and Cymede and isn't worth using over Emerge Unscathed in the sideboard. Chance for Glory can be fun in casuals but I wouldn't make it a mainstay because it is too conditional. I tested Rush of Adrenaline and Integrity / Intervention against Titan's Strength and it's obvious Titan's Strength is better. The scry is just too valuable for consistency.